I'm sure your kiddos are as obsessed with the "What Does the Fox Say" song just as much as mine are! The other day some of my superstars were singing "What does Ms. Gaines say!?" "learn learn learn learn stickers stickers" - which I thought was hilarious, but alsooooo a great idea! If I chose animals that the kids could rhyme with, we could ask what they say and they could rattle off rhyming words! So, I went to work and crafted up these guys you see on your left. It's pretty simple in the execution of this craft. I broke it down into first grade and second grade levels in my packet. My firsties used my writing prompts to cut and paste the rhymes that went with their animal (hat, mat, etc.). They had to use discrimination and work with peers to trade words to complete their speech bubble. My second graders had to generate the words on their own and do some writing. I prompted those who needed it with the visual or auditory cue that was appropriate. While the kids put together the craft part of the activity, we listened to the song...and then promptly danced around the speech room. The packet on TpT is 12 pages filled with the differentiated craft, along with some take home worksheets. There are two full sets of crafts on each page to save on paper. I also provided you with a speech bubble template, but you can always cut your own out from construction paper! 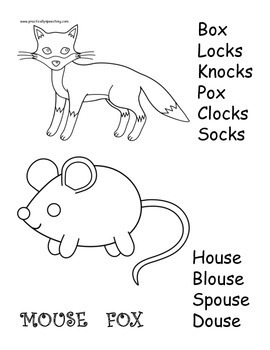 You can download this fun activity here and start asking "what does the fox say!?" for real!